I thought I would try to start a new segment in the blog on Thursdays. Every Wednesday night when I get home I could never go to sleep because my adrenaline is going running high. I usually come home, say good night to my wife and I watch a few episodes of The Office as I check out student ran Snapchat story to make sure there is no questionable posts (HA!). But I’m up and thinking about service. So I thought I would pay homage to Josh Griffin‘s posts he used to do when we were Saddleback High School Ministry together. He would always do “Weekend in Review” and go over the aspects of the weekend. I thought it would be fun to continue on that tradition. Sermon in a Sentence: Jesus coming as a baby was so vulnerable. In a world of fakes, be vulnerable and watch what God does. Understandable Message: This was a little different night. We were talking about vulnerability, I didn’t want to ask students to do something I was not willing to do myself. So instead of a “normal” teaching, I had students write down questions to ask me… about anything in my life, faith, family, marriage, fears, struggles etc. It was scary but it was powerful. Had a student come up to me after and tell me it was one of their favorite nights because it made me “human” (which I thought was funny). I hoped that being vulnerable with them challenged them to be like Jesus and be vulnerable themselves and see how God moves. Element of Fun/Positive Environment: We played a fun game called “Hum-dinger” where students would come on stage and were given a song and they had to hum it in the microphone and then a student would have to guess what song. It was suer fun and it was all Christmas songs. After service, we had hot chocolate for everyone. It’s so easy and simple and they love it and it gave our students and leaders a great opportunity to hang out. Favorite Moment: There were few: 1) We had a baptism. YES! 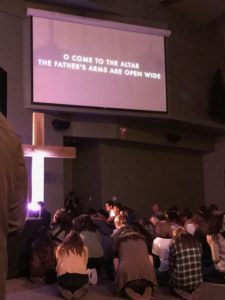 2) In the idea of vulnerability I invited our high school students to be vulnerable and if they had something in their life where they know they need to see Jesus in, to come to the alter and kneel at the foot of the cross with me. (See pic above) 3) I got to pray with a student who was invited by her friend for the first time to accept Jesus as Lord and Savior. Wow. Thank you Justin! I miss hearing what others are doing and always enjoyed reading Josh’s posts. Awesome! Love it!I’m excited for this little series!